Currently, Class 8 trucks, the typical tractor-trailer used for hauling cargo through North America, burn around 5.8 gallons a mile (40.5 liters/100 km). Since these trucks are used to haul around 80% of goods cross country, their impact on the US carbon emissions is significant. Case in point, they only make up 4% of the vehicles on US roads yet guzzle 20% of the fuel used. Improving fuel economy isn’t easy, but other companies have been able to squeeze out fuel savings. 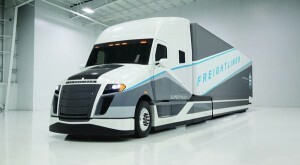 Recently, however, Daimler came up with the Freightliner that got 12.2 miles per gallon (19.3 liters/100 km)! This they proved on a 312-mile (502 kilometer) round trip between Dallas and San Antonio, running at an average of 65 mph (104.6 kph), among other tests. In order to achieve this, the company designed a bit more like a sports car with smart driving technologies like coasting and predictive shifting, aero grills, drive wheel fairing, and drivetrain improvements. Other things that the Daimler engineers are investigating are “electrified auxiliaries, controlled power steering and air systems, active aerodynamics, a long-haul hybrid system, waste heat recovery and trailer solar panels”. What may come out may not be an Autobot, but it’s sure helluva fuel efficient workhorse. They do not burn 5.8 gallons per mile, they get 5.8 to 7 miles per gallon (depending on load terrain speed etc). Might want to fix the story as if that was true most trucks would have a 40 mile range on 200 gallons and they in fact can usually go over 1000 miles on 200 gallons.